The classic red gems known as strawberries are this week’s feature of my dehydration project series. I was one of those kids who always wanted the strawberry flavored thing: strawberry lollipop, strawberry chapstick, strawberry gum ball, and even the strawberry flavored fluoride at the dentist office. Ironically enough, I like strawberries in every form except eaten raw. I know, it seems ludicrous! I have internally battled with this myself. I love strawberry ‘everything’ so much, so I don’t know why it is difficult for me to love eating them in their most plain and natural state. I have tried several times to like them raw but it is something I can’t force. Fortunately, there are many other ways to enjoy these delicious delights. 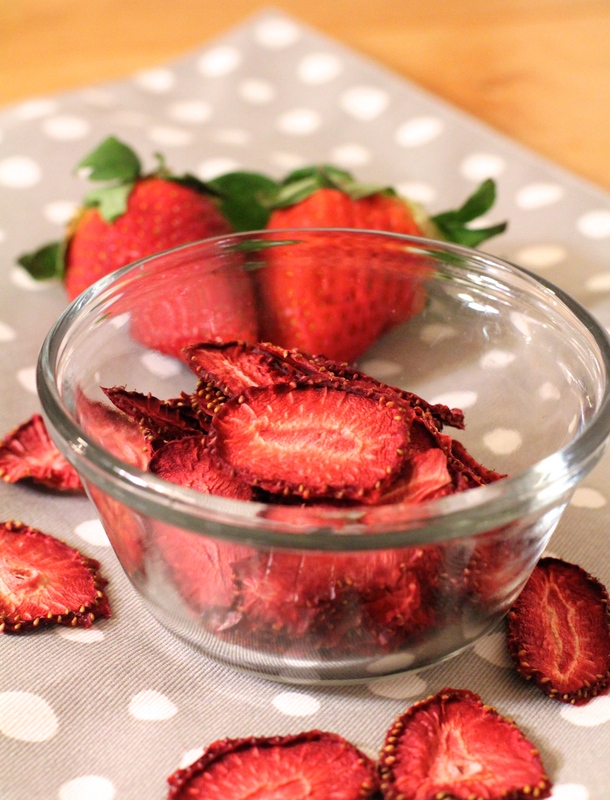 That sets the precedent for today’s dehydration project trial: dried strawberries. Dried strawberries are the perfect little snack or can be added as a nice touch to cereals or homemade granola bars. Cut into 1/8-1/4 inch slices. Be consistent with the width to ensure they dry evenly. 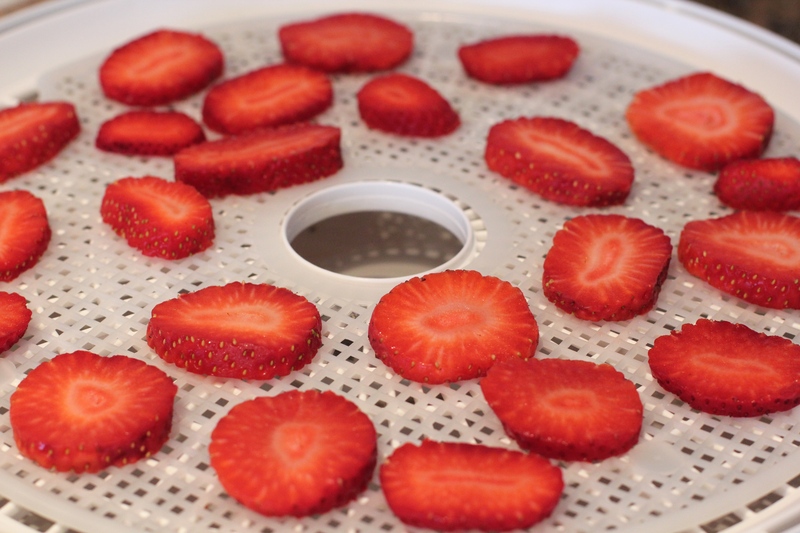 Set the dehydrator to 135 degrees F. It took me 8 hours for mine to dry to a nice crispness- but I think a range from 6-10 hours would be appropriate. You will need to monitor them until your desired state is achieved. There is no need for any pre-treatment before drying- they keep their natural color just fine! I haven’t tried but I imagine the concept is the same! The dehydrator heat is 135 degrees F for 6-8 hours; so you may be able to do that in an oven😉 I may have to try that myself- I have never tried to dry anything in an oven! Wow those look amazing! I definitely want to try making these abs/or another dehydrated fruit! I use freeze dried fruits often for my raw preparations, maybe I’ll try dehydrating them next time! !